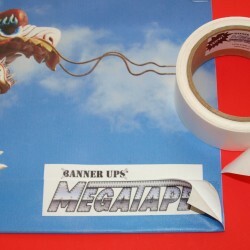 Banner Ups® MegaTape is a double sided Banner Hem reinforcing tape that is made of a super strong film. Now with a new clear film, MegaTape banner hem tape is even stronger than our original product – 10% stronger in both lab tensile tests and wind tunnel test. Improved MegaTape banner hem tape withstood winds up to 108 MPH!! (watch the amazing video below) Use MegaTape when ultimate banner strength is required. Easy to apply banner hem tape. Wears like steel! Use for double-sided banners – tape is hidden in fold. What is the difference between MegaTape® and PowerTape® ? MegaTape® is just a double sided adhesive version of PowerTape® made with the same super strong film. Has the adhesive changed on NEW IMPROVED MegaTape? No. The adhesive is unchanged. The only difference is NEW IMPROVED MegaTape’s stronger clear film. Does MegaTape banner hem tape work on mesh banners? MegaTape’s new clear film is ideal for mesh banners because it is less visible when folded in a mesh banner hem. Why use MegaTape® banner hem tape instead of PowerTape®? MegaTape® is recommended when you desire a folded edge on the banner rather than the unfolded edge with PowerTape®. There are a few tips that will help. First, it helps if you can clamp both ends of the banner on a table with just a little tension to remove any wrinkles. Next, you don’t need to place the PowerTape® exactly along the edge. It is better to give yourself ” to ¼” leeway to allow for any slight wandering as you go down the banner. You will develop your own technique, but we have always found it helpful to pull off an arms length of tape at a time and lay that down, using some tension to keep the tape straight then pull off another, etc. How is MegaTape® different from ordinary double-sided banner hem tape? 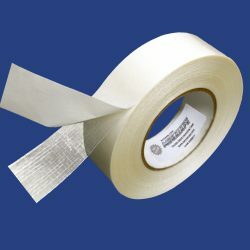 MegaTape® is made with a super-strong film which makes it far stronger than regular banner tape. Plus, because of the superior rigidity of the MegaTape®, it is much easier to produce a firm sharp edge than with banner hem tape. Will MegaTape® wrinkle when the banner is rolled? How can Megatape® be used on double sided banners? Unlike regular PowerTape, Megatape® is completely hidden when applied. Double sided banners can be made with art that matches on the reverse side when folded, making the banner hem super strong, yet nearly invisible. Can MegaTape® be used with grommets or Clear PowerTabs? Yes. After installing MegaTape®, feel free to install grommets, or for greater strength, PowerTabs, or both for ultimate strength, according to your needs. This product is ideally suited for customers who like the strength of PowerTape®, but who prefer the look of a folded hem. Now, they can have the best of both products! 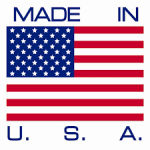 Contact us to learn more about our heavy duty banner tapes.